KMA offices are located on the first floor of 1 Bridge Street. Parking is available in the lot. 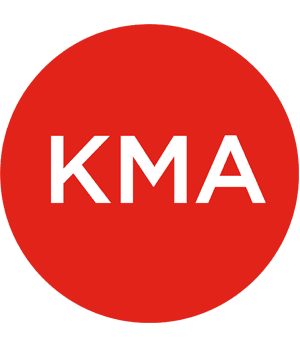 KMA’s offices are fully accessible. From the West: Masspike to Exit 17 – follow the signs for Route 16 East. At CVS continue straight ahead on Washington Street (do not bear left onto Route 16). Take a right onto Admas Street, a right onto Watertown Street, followed by a left onto Bridge Street. 1 Bridge Street is at the corner of Bridge Street and California Street. From Boston: Masspike to Exit 17 – Turn right onto Centre St (signs for Watertown). At Starbucks, continue onto Galen St. Turn left onto Morse St. Turn right onto Watertown St. Turn left onto 5th Ave. Turn left onto California St. Turn right onto Bridge St. 1 Bridge Street is on the corner of Bridge Street and California Street. From the North: Take Route 128/95 South to exit 27A for Totten Pond Rd toward Wyman St. Merge onto Winter St. Continue onto Totten Pond Rd. Use the right 2 lanes to turn right onto Lexington St. Turn left onto Beaver St. At the traffic circle, take the 1st exit and stay on Beaver St. Beaver St turns slightly right and becomes Lyman St. Turn left onto Summer St. Continue straight onto Ellison Park. Turn left to stay on Ellison Park. Turn right to stay on Ellison Park. Turn left at the 1st cross street onto Main St. Turn right onto Lafayette St. Turn left onto Grove St. Continue onto Waltham St. Turn right onto Bridge St. 1 Bridge Street will be on your right. From the South: Take Route 128/95 North to take exit 21 for MA-16 toward Newton/Wellesley. Turn right onto MA-16 E/Washington St(signs for Waban/W Newton). Use the right 2 lanes to turn slightly right onto Washington St. Turn left onto Watertown St. Turn left onto Linwood Ave. Turn left onto Crafts St. Turn right onto California St. 1 Bridge Street is at the corner of California Street and Bridge Street.